Jay is passionate about understanding the links between the structures of the body and the way it functions in everyday life. He has experienced the advantages of treating the body as a unit when examining, diagnosing and helping the tissues to resolve and repair damage. He appreciates that all levels of pain and dysfunction can have far reaching effects on every aspect of life. Jay has a keen interest in exercise, nutrition and striving for physical fitness and achievement. 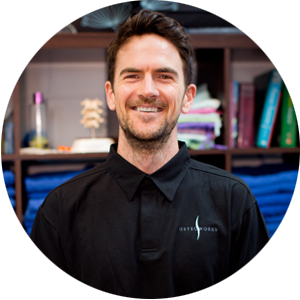 He realises that reaching fitness goals is important to many clients and is happy to incorporate maintenance, prevention and relief into his treatment sessions. He completed his Bachelor in Clinical Science and Master of Osteopathy at Southern Cross University, New South Wales, Australia in 2014. Here's a way to decompress your ribs and recharge your lungs. We use them everyday for just about everything, here's how you can look after them.